Macadamia nuts are also produced in the continental U.S.
Getting macadamia nuts fresh from the farm doesn't require trans-Pacific travel. The United State's second-largest macadamia industry is in San Diego County. UC Cooperative Extension will sponsor a field day for current and aspiring growers Nov. 6, according to an article on the website Ah-Ha Rancho Santa Fe. Held in conjunction with the California Macadamia Society and the Gold Crown Macadamia Association, the event will be at the macadamia farm of Garry and Patricia Prather, 6686 Via de la Reina, Bonsall, Calif.
Macadamia nuts are native to Australia. In 1946, a large plantation was established in Hawaii, and the crop eventually became as closely associated with the archipelago's agriculture industry as sugar and pineapples. Macadamias have been grown in California continuously since 1879. According to the San Diego County agricultural commissioner crop report, county growers produced 128 acres of macadamia nuts in 2006 accounting for 192 harvested tons worth $342,336. Subtropical horticulture farm advisor Gary Bender, co-organizer and a presenter at the event, said macadamias also make beautiful back yard trees, planted in the landscape or in large pots or tubs. But macadamias require patience. Seed to tree takes 5 to 7 years; full production may take as long as 10 years. At the field day, Bender will explain irrigation scheduling for macadamias. UC Integrated Pest Management advisor Cheryl Wilen will discuss chemical and organic weed control in macadamia production. Bender said the field day promises to be a day of fun, food and information. More information is on the San Diego County UCCE calendar. 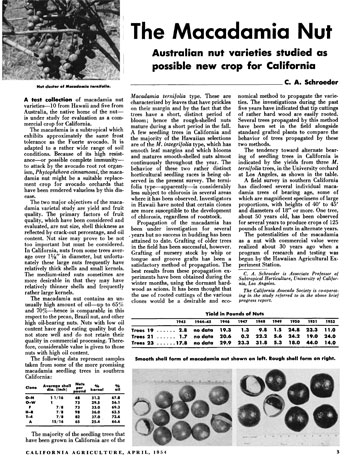 A 1954 UC article suggested macadamias could be a viable new crop for California. I believe that macadamia nuts can be grown in other parts of the US, and I would like to inform farmers, researchers, and hobbyists.